Crafted from Pine solids and veneer, the Hayden dining set by Intercon Furniture is a beautiful grouping to complete your living space. It features a durable, high-quality lacquer finish in espresso that includes unique hand distressing with rough sawn finish accents. Add high functionality and fresh design to your dining room today with the Hayden Dining Room Collection. 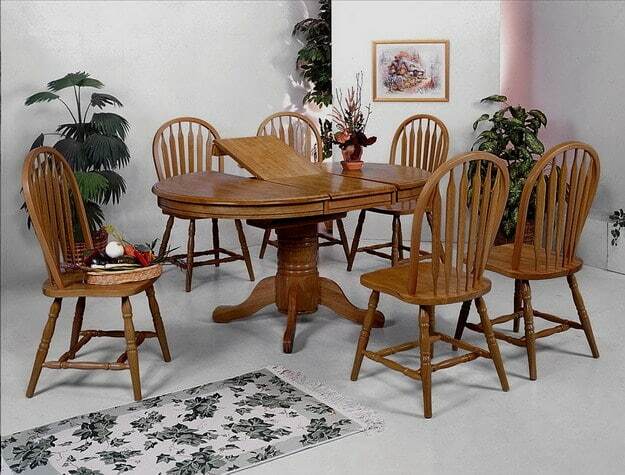 *Set includes a dining table and six chairs. Crafted from Pine solids and veneer, the Hayden Dining Room Series by Intercon Furniture is a beautiful grouping to complete your living space. It features a durable, high-quality lacquer finish in espresso that includes unique hand distressing with rough sawn finish accents. Unique hand distressing adds an aged rustic look to each piece. Metal table slides allow for easy opening and closing of the table, as a 20-inch leaf is included, allowing you to extend this table to a larger sizes for guests. Each slat back chair is cushioned with a brown cushion seat. Add high functionality with a fresh design to your dining room today with the Hayden Dining Room Collection. Established in 1976, Intercon has become one of the leading manufacturers, importers, designers and suppliers of solid wood furniture. They provide classic, quality products, including dining room, bedroom, home office and entertainment furniture. Its their mission to continue producing exceptional furniture with lasting value.